This month, I am giving a broad overview of plant science, plant scientists, and other aspects of plant biology. This is so I can get my blogging feet under me. This post starts to get to more of how plants work, a more mechanistic look under the hood before I start in on more specific stories of plant science each week. Humans and other animals have senses to interpret their environment and internal states of being. Sight, smell, touch, hearing, and taste are the tip of the iceberg. Gravity, balance, knowing where our body is in space, pain, pathogen recognition, thirst, hunger, and even emotions can be though of as social senses. The cells that make up life adjust to whatever their senses are telling them, to the cues they get. Plants have senses too. Many of the same ones we have, though the precise mechanisms are different. In some ways, plants may be more sensitive because they cannot get up and move like most animals can. Plants have to adapt to the place where they find themselves. In fact, Daniel Chamovitz, a plant scientist, has written a book about plant senses called ‘What a Plant Knows’. The cover image of this blog is of daisy seedlings growing out of the senescing flower of that created them. One of the seedlings is longer and less green than the other ones and has a purple ring near the top. What’s going on here? My hypothesis is that this is an example of how plants respond to light. The rest of the seedlings are fully green. That one that’s long and paler likely germinated in the dark, in the middle of the night. 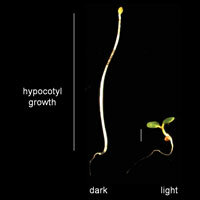 Plants don’t just use light to photosynthesize. It is a vital source of information. Plants have a suite of light sensors that detect most of the visible spectrum of light and just beyond. This helps optimize photosynthesis. It also helps plants detect neighbors, train their circadian clocks, determine when to start flowering, and when to start going dormant for the winter. 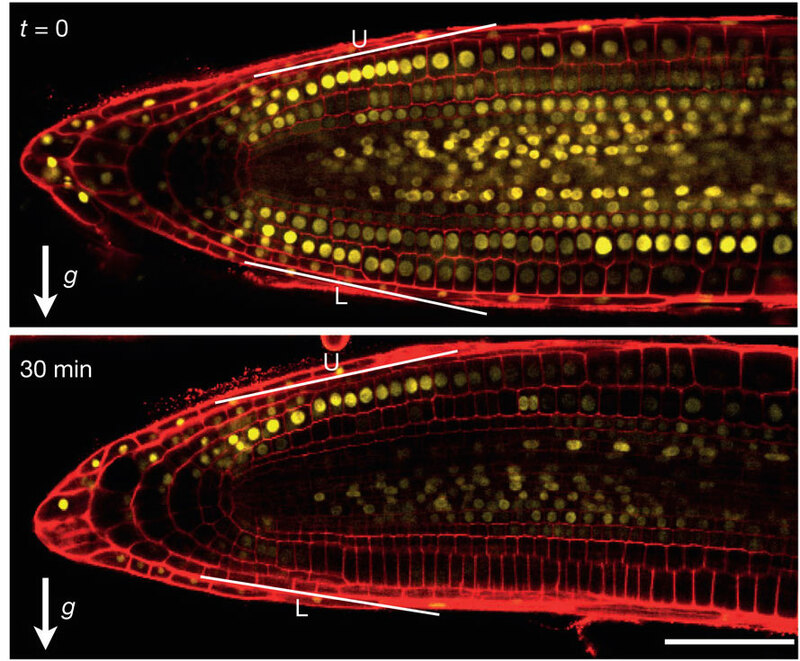 In Arabidopsis some of the light receptor genes (those segments of DNA that are the blueprint for the organism) are expressed in a surprising place: The root. And there is some evidence that light, dim though it may be through soil, can have an impact on the growth habit of roots. I’ll bet even plants that don’t photosynthesize, like the Indian Pipes in my previous post, have some of these informational light receptors intact and use them to inform their growth and development. Plants can sense touch and sound too (since sound is just moving air, the affect on a plant can be like touch). A root that runs into a rock while growing down to seek water can change direction to grow around it, for instance. An animal that eats or damages a leaf can trigger a defense responses. In the case of the bunchberry, any disturbance can send it’s pollen shooting into the air to land on nearby flowers from a biological hair trigger (this is the fastest plant response ever recorded). Another type of mechanical sensing in plants is gravity. Roots tend to grow towards the direction of gravity (towards the center of the Earth), while shoots tend to do the opposite. There are organs within the cells of the tip of the root responsible for root orientation (‘organelles’ in cell biology parlance– a large body within a single cell). In this case these organelles are called stratoliths. They are derived from a precursor organelle that become photosynthesizing chloroplasts in shoot tissues. They act as tilt sensors akin to accelerometers in smart phones that re-orient displays. If a root is turned, to grow with gravity again, stratoliths settle in the side of the cells closest to the direction of gravity. As a root turns towards gravity, these organelles, called stratoliths move in the cell. Once the root is growing ‘down’ again, the plant can stop adjusting it’s root growth. Plants like peas and soy beans attract symbiotic bacteria to them. In an elaborate interaction, theses plants engulf specific bacteria. The bacteria then live inside the plant root and harvest (“fix” in plant science lingo) nitrogen from the atmosphere. Pathogens attack plants and some animals eat them. In either case, when this happens, plants respond by raising its defenses. Plants respond within the site of attack and can also signal the rest of the plant of an invading pathogen. In some cases, the signal can be passed to neighboring plants that they’re being attacked. And in more chemical warfare against herbivores, some plants can even attract predators of an insect that is eating them. 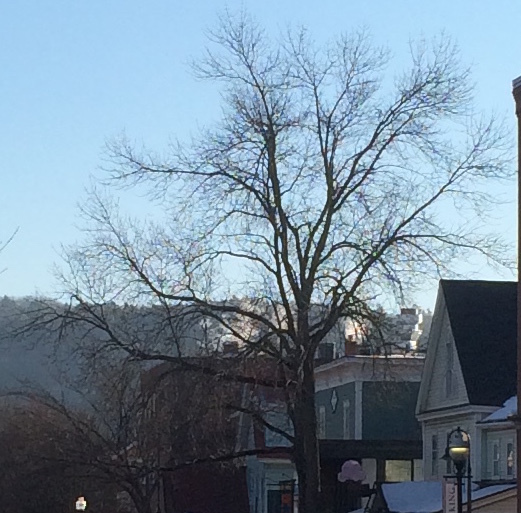 Think about a tree that loses its leaves and seems dead all winter only to bloom again in the spring. There is a complex dance with environmental cues that goes on. Plants can sense their health status too. Whether they’re getting enough water or have enough nutrients. And respond to whatever is happening. There are extremes where plants can’t survive, but it is remarkable what a plant can put up with given enough time to respond. Think about a tree that loses its leaves and seems dead all winter only to bloom again in the spring. There is a complex dance with environmental cues that goes on. For instance, if a warm spell hits in February for a short time, most plants will stay dormant. Not all the conditions are right. However, with climate change, there are plants blooming earlier and earlier in the year. In some cases even in the middle of winter due to sustained warmer average temperatures. This can throw off the long-set dynamics of interacting with pollinators. Although there has been progress in just how plants sense temperature, the precise mechanisms still aren’t known. Tree dormant for the winter. It looks dead, but it is not. It is sensing it’s environment and will bloom when the spring comes. Plants have internal cues as well. Many in the form of small molecules called hormones. Hormones are fascinating, though I am biased since that is what I work on. Environmental cues result in a series of events that cause responses that affect various hormones. So yes, plants (and animals) are able to sense hormones that influence behavior (and yes, plants have behaviors). The gravity sensing example is a good case of a hormone response. The sensor for gravity in the tip of the root. However, the turning of the root is in another part of the root, more towards the shoot (See figure). To bend towards the direction of gravity, the plant has to transmit a signal from where the gravity is sensed to the cells where the plant can cause bending. In fact, this trick requires coordination across the root. If you think of the root as a cylinder, bending requires enhanced elongation on one side (the ‘top’) and inhibited growth on the other (the ‘bottom’). In the example here, I’m reducing the root to two dimensions when it’s really a 3-D structure made of cells. The way the plant induces this differential growth is by altering the concentration of a hormone: auxin. Auxin is constantly transported throughout the plant. If a plant root is not growing with gravity, it can adjust the flow of auxin to decrease it on the ‘top’ side and to increase it on the ‘lower’ side, inducing roots to bend (see figure). Of course there are other considerations a plant root has. Water tends to be down in the soil, but nutrients may be asymmetrically distributed in the soil and plants can grow towards them as well, if need be. And roots can branch just like shoot systems. Making sense of a complex environment is no small task, but it is something that life has to do, including plants. Pingback: Plant and Human behaviors. | order today!